Take a look at 50 very different patio covers—certain to spark some ideas for your own project. The South African firm LevEco Architects designed an overhead with a ceiling made from IsoPine, which is a composite polystyrene material that functions well outside, provided it doesn't get direct rain. The timber roof rafters are pocketed into the brickwork of the house, so you don't see any connections. The roof sheeting is attached with flashing and waterproofing. A Moroccan-style rooftop patio in Hong Kong was designed by Alexandra Lauren. The roof is made of clear Perspex with UV resistance. The rug is from Horchow. Lauren has studios in Tennessee, Hong Kong, Arizona, and Montana. The husband-and-wife design team known as Phoenix's The Ranch Mine covered a house in corrugated steel and treated the concrete flooring with Cohills Enviro Stain. Shade-sail anchors were tied into the roof trusses under the eaves to support the shade sails. 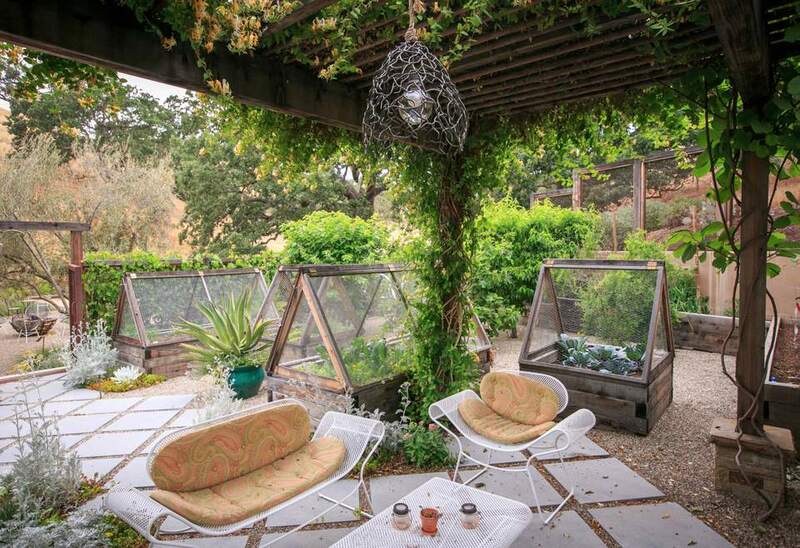 A beautiful and eclectic eco-conscious outdoor space was created by Carson Douglas Landscape Architecture for a Santa Ynez, California ranch. Many features are custom designed, like the redwood pergola, which supports healthy, lush vines; the redwood vegetable boxes, cold-season A-frames, and metal-frame fire pit, infilled with stone to resemble a gabion. The hanging light fixture is also a CDLA creation and is available on the firm's website. Gast Architects of San Francisco created shade for a scored-concrete patio in Arroyo Grande, California by constructing a custom-made steel frame that supports corrugated galvanized-steel roof panels. ​The roof panels are Sinewave. Designed by Eklektic Interiors of Houston, this home was built by the homeowners, who are in the construction business. The patio floor is made of reclaimed Old Chicago brick, while the facade and arches are made of Texas limestone. New York City-based Resolution: 4 Architecture constructed a stained-cedar pergola over a bluestone-paver patio for a home and pool house project in South Hampton, New York. A small house in Orange County, California received a makeover by Benedict August. Slate tile set in a diamond pattern is used for the exposed patio, while the covered dining space features a poured-concrete surface. The lights are older Z Gallerie chandeliers. An entry courtyard for a home-based work/art studio designed by Homes by Monticello in Missouri features cedar decking and slat walls. A corrugated plastic roof adds rain protection and allows natural sunlight to filter through. The home is built around a grain silo, giving it a "modern industrial" sensibility. Raising the roofline and adding clerestory windows to this mid-century ranch house in Aspen, Colorado flooded the living spaces with natural light. Rowland and Broughton added a rooftop patio to the single-story home, along with a patio off the back of the house with white polished concrete flooring. 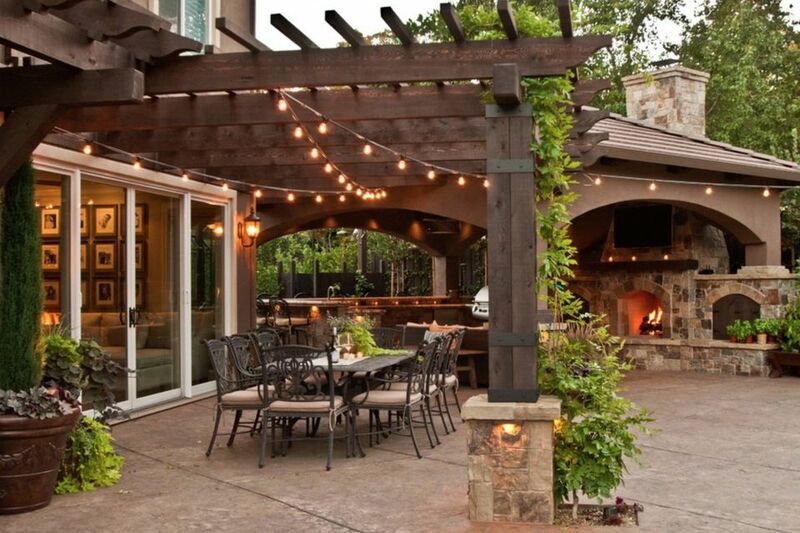 The patio cover features tongue-and-groove stained fir blind-nailed to the ceiling and Texas limestone columns and a fire pit. The modern Rising Glen house in the Hollywood Hills by Tocha Project features a custom-designed deck. The patio cover's levelers (shades/blinds) are motorized and operated by elevator buttons located in the home's bar area. Like many components of Rising Glen, the patio levelers were customized by Janna Levenstein/Tocha Project. Strening Architects of Santa Rosa, California transformed a 25-acre property in Calistoga into a spectacular showcase by creating two distinct outdoor loggias on the front and back of the house to take advantage of wine country indoor/outdoor living. Strening used a simple palette of stone, stucco, wood, and steel to bring refined elegance to the property. The patio cover is a combination of painted structural steel and Alaskan yellow cedar. A 1950s Seattle home, remodeled by Lane Williams Architects, features two 16-foot-wide Fleetwood pocketing aluminum and glass sliding doors that open the den and dining rooms to the terrace. The steel and wood-frame covered patio is made of Polygal translucent ribbed panels. LWA was about to save the original 1960-built outdoor brick fireplace, which was incorporated into the new patio design. Designed by Michael Abraham Architecture of Clarendon Hills, Illinois, Basswood is a custom-built farmhouse-modern estate at Lake Geneva, Wisconsin. The patio flooring is made of natural bluestone, while a sun-drenched outdoor room features large spans of glass with contemporary lines that frame views of the lake. Hand-hewn beams, exposed timbers, and indigenous stones were used in building this outdoor escape. Located at Manly Beach in Australia, this 1950s-inspired home by Sanctum Design features a motorized canopy/glass awning from the German company, Markilux. A Mexican-inspired patio for a home in Metairie, Louisiana was designed by Mullin Landscape Associates. Hanging from the painted wood-frame shade structure is a gold and white pendant lamp from Ella Home. The homeowner bought the colorful pillows on Etsy, while the green rattan chairs are by Kenian. The design firm Mr. Mitchell warmed up the interior and exterior of a contemporary coastal home in a suburb of Melbourne, Australia. Included in the remodel were recycled Australian hardwoods, natural stone, and textural fabrics. Texas Custom Patios built a pergola off the side and front of an existing covered area and added an outdoor kitchen to maximize outside living space. A custom classic home designed by PHX Architecture is in the Silverleaf Parks area of Scottsdale, Arizona. The home offers relief from the desert heat inside and out with several covered areas that extend from the main structure. The homes offer beautiful views of Phoenix. An outdoor spa gets a tropical overhead with a hardwood frame that supports a palapa (thatched roof), designed by Utopia Landscape Design of Brisbane, Australia. A Mid-Century Modern remodel by Webber Studio in Austin, Texas includes indoor/outdoor Leuder's Limestone flooring, which runs from the front entry through the interior, out to the patio, and becomes the pool coping. The wood-framing used throughout the exterior is repeated in the shade structures. Dena Brody Interiors transformed this outdoor space into a true living room complete with Gloster patio furniture, ceiling fans, and a custom kitchen. The closed and open-beam wood overhead is supported by metal posts. A high, transparent patio cover designed by in3interieur allows unobstructed sunlight into the house and also keeps the patio area warm on summer evenings. Higgins Architects of Scottsdale, Arizona designed a Camelback area home that includes several outdoor areas, including this shade structure with metal framework and a thatch-style roof. An exterior-grade open-weave solar fabric shade helps block the rays of this Austin patio designed by Paula Ables Interiors. The fabric is attached to a track along both sides and is moved via a detachable rod. Laguna Beach architect Robert A. McGraw designed a simple wood-slat shade structure that doesn't compete or obstruct views of the Pacific. A young family's passion for the Colorado lifestyle is reflected in the outdoor space created by Mitchell Wall Architecture and Design. Built from local woods, the covered room attaches to the home and flows from the living room and kitchen to the yard and swimming and spa areas. Custom designed and installed by Jenna Bayer Garden Design, this Palo Alto patio cover is made from a steel-engineered structure ​and a shade fabric with 70% filtration. Walnut Hill Landscape Co. in Baltimore designed a vacation home in Annapolis, Maryland that evokes Tuscan charm and offers breathtaking views of the Chesapeake Bay. Wisteria and Lady Banks roses are planted at every column for mass coverage. It looks like Bali and is called Bali House, but this home with elaborate architectural and decorative details created by Indonesian craftspeople is actually in Kihei, Maui. The home was designed by Rick Ryniak Architects. JCR Design Group of St. Louis, Missouri created a new look for a Ladue home with the addition of a three-season screened-in porch, along with a new and enlarged patio and hot tub. A modern hardwood flat-roof overhead was built by Rick Ryniak Architects to allow the homeowners to relax and enjoy the surrounding view. Architect Mark Buchanan of Newmann Lewis Buchanan Architects designed a simple shade structure at this Washington DC area farm using metal arching framework supporting a reed-grass cover. Birdseye Design created a rustic and elegant paved path that also serves as a narrow patio for this house in Jericho, Vermont. Several years after the installation of this corrugated cold-rolled steel roof at a Utah home, there are no signs of major corrosion. According to the designers, Carney Logan Burke Architects, plain, cold-rolled mild steel doesn't corrode significantly, even after 50 years. A slate patio is shielded from the sun by a wood overhead structure that extends from the home's roofline for a natural transition from indoors to out. The project was designed by John Montgomery Landscape Architects. A wood frame supports an A-frame overhead that serves as a complete outdoor living space with stone fireplace, TV, outdoor kitchen, and seating. The project was designed by Texas Custom Patios. The Carolina by Designs on Madison is a complete home project that includes an outdoor wood pergola allowing filtered light and just enough shade for dining comfortably. Emeritus Development in Massachusetts designed a beach-style residence with a wood pergola that features a flat, open roof and custom-built brick fireplace for stylish outdoor living. Concrete blocks create a decorative wall feature for this courtyard in Perth, Australia, designed by Dale Alcock Homes. Wood beams attach to eaves and another shade structure, making the courtyard a more open space to catch some rays. A wood pavilion designed by Cedar Springs Landscape Group of Ontario, Canada provides protection from sun and snow. An intricately detailed, polished wood ceiling is the focal point of this outdoor structure designed by Texas Custom Patios. John Montgomery Landscape Architects designed a dining gazebo that was built to take advantage of the gorgeous Central California view. Living space for this Seattle house was extended outside by American Louvered Roofs of Western Washington. Wood columns and decking support a sold roof that provides shelter from sun and rain. Even when it's raining or snowing, the Canadian homeowners of this solid-wood covered room designed by Cedar Springs Landscape Group can feel like they're still outside. A 16- by 20-foot pavilion designed by C.E. Pontz Sons of Lancaster, Pennsylvania, features a faux slate roof. The TV was hung from the pergola with a wall-mount. A pitched or hipped wood roof of a gazebo is supported by stone columns. The design is by John Montgomery Landscape Architects of Alamo, California. Starting with pretty much a new, clean slate, Paradise Restored of Portland, Oregon created a wood pergola that extends from the house and shades the outdoor kitchen, dining table, and provides privacy for the hot tub. LiquidScapes of Pittstown, New Jersey designed a poolside gazebo that features a modified gabled-style roof for architectural interest and to provide shade, of course. The simplest way to add shade to a patio or any outdoor space is by opening an umbrella. Just make sure it is sturdy and anchored by a weighted holder or it will be gone with the next big wind!